Some day in the far future, it’s possible our descendants will kick it up a notch and wrap the entire Sun in a massive solar-collecting shell known as a Dyson Sphere. It’s also possible that some advanced alien civilizations have already gone this route, which is why some SETI folks are on the lookout for these hypothetical objects. But a new study proposes that aliens are more likely to build megastructures around pulsars than stars—and importantly, we should be able to detect these objects from Earth using current technology. Conceptually, Dyson’s hypothetical sphere makes a lot of sense, particularly for advanced civilizations with a huge appetite for energy. By constructing a thin spherical shell around its sun, a civilization could capture oodles of solar energy that would otherwise bleed uselessly into space. Graduating to a Type 2 Kardashev civilization sounds all good and well, but constructing—and maintaining—a megastructure of this scale won’t be easy. The shell itself would be located around one AU from the host star (that’s the average distance the Earth orbits the Sun). Consequently, the amount of material required to build a Dyson Sphere would be literally astronomical, and some experts have speculated that, if we were to ever build a Dyson Sphere, we’d have to dismantle Mercury, and possibly even Venus and the Asteroid Belt. Unfortunately, this could disrupt the delicate gravitational balance within the Solar System, leading to downstream consequences like planet-on-planet collisions. Other challenges exist as well, such as maintaining the shape and position of the shell, and repairing the endless damage wrought to the structure by incoming asteroids and comets. It’s for these and other reasons that Zaza Osmanov, an astronomer from the Free University of Tbilisi, believes that Dyson Spheres aren’t the way to go. In a paper he published last year in the International Journal of Astrobiology, Osmanov said that Dyson Spheres are “unrealistically massive and cannot be considered seriously,” and that aliens (or future humans for that matter) are more likely to build Dyson Rings—a stripped down version of a Dyson Sphere. What’s more, he said aliens weren’t likely to construct these solar-collecting rings around stars, but pulsars instead. Now, in a follow-up study to this first paper, Osmanov is arguing that we should be able to detect these structures from Earth. 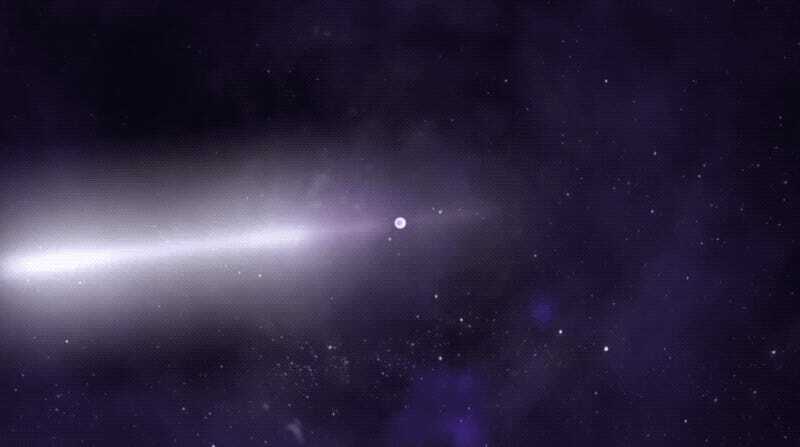 According to Osmanov, advanced alien civilizations are likely to exploit this high-power celestial phenomenon. Extending Dyson’s concept to pulsars, he says a ring of solar panels could be constructed around a slowly-rotating pulsar (spinning around about once every half second, so not that slow) at a distance of around nine million miles, or roughly one-third of the distance between Mercury and our Sun. He estimates that the Dyson Ring would be exposed to temperatures of around 117 degrees C (242 degrees F), which would make the object visible to observers on Earth in the infrared (IR) band. “But it makes sense to look at pulsars to see if there is something there: They are rare enough to stand out—and it has been suggested that SETI should look near them for this very reason—and they might have accessible energy sources useful in ways normal Dyson swarms aren’t,” he said.